Their final consequences in terms of health outcomes, financial protection and responsiveness to the population's legitimate expectations, i.e. a performance assessment of reforms and health systems. 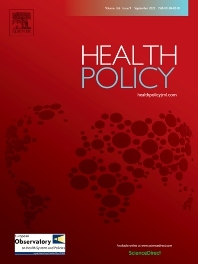 To achieve the journal's objectives, authors are encouraged to write in a non-technical style, which is understandable to health policy practitioners and specialists from other disciplines and in other countries. Please submit your article via http://ees.elsevier.com/heap. Electronic usage: An increasing number of readers access the journal online via ScienceDirect, one of the world's most advanced web delivery systems for scientific, technical and medical information. 2017 Usage: 711,797 article downloads on ScienceDirect and healthpolicyjrnl.com.